Our first theme for the Convent book club this year is Epistolary narratives. Unfortunately Meg Cabot's The Princess Diaries is in diary rather than letter form, but never mind! I can see why this novel spawned a highly successful series and movies. Mia is a breezy, funny teen who is more concerned about the social consequences of her mother dating her maths teacher than the fact that she herself turns out to be the hair to the throne of a European principality. 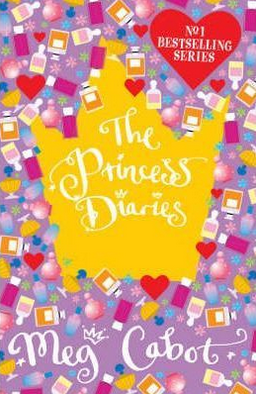 At fourteen, Mia agonises over her crushes, her hair, and myriad possibilities of social embarrassment, but she doesn't seem to think particularly deeply about anything else, which made this an easy, amusing read, but not a very meaningful one. Published in 2001, the references to technology have already dated. Mia receives 'princess lessons' from her exacting French grandmother, which revolve around etiquette, though one would think politics might be useful, too. When I imagined being a princess at twelve or thirteen, I saw my alter ego making unexpected diplomatic interventions, not just sweeping around in gorgeous ball gowns (though to be fair, there was a bit of that, too). But maybe that was just me!